When Japanese balloon bombs, known as Fu-Go to their makers, first began to arrive in America, authorities mistakenly thought that the devices were being launched from submarines surfacing near our coasts or that they had been built in Prisoner-of-War camps along the coast. American scientists had not yet learned about the Japanese discovery of the high-speed winds in the upper atmosphere. After it was determined that a balloon launched in Japan might reach North America in about three days, the Imperial Army set to work to design and launch the new weapons. A wet-cell battery powered the barometric trigger that blasted explosive plugs to drop ballast bags. It also ran the timer and the bomb release mechanisms. School children and other non-combatants were conscripted to laminate sheets of mulberry paper together to create fabric for the balloon envelopes. Rubberized silk was used on some of them. A complicated device had to be designed to stabilize the balloons’ altitude. Heat from the sun could cause the hydrogen inside the envelope to expand, eventually causing the paper to rupture, so an escape valve that would operate at high pressure was created. 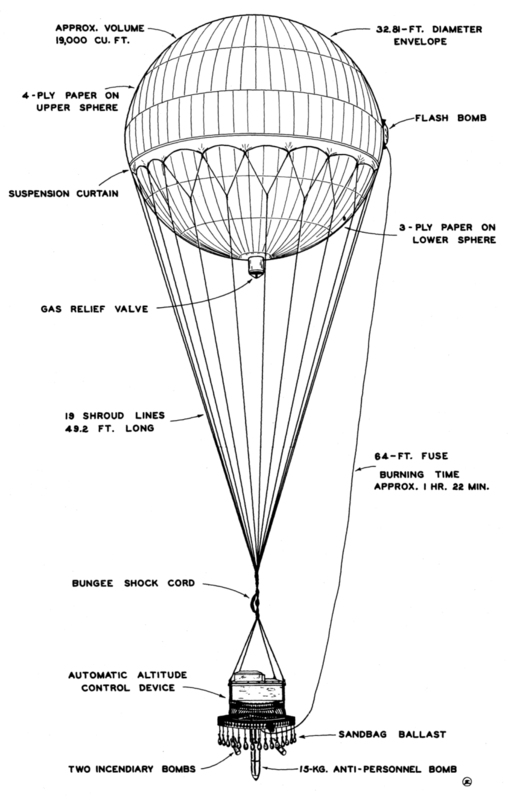 If the balloon sank too low, a pair of explosive caps would fire, allowing two bags of sand to drop off a metal wheel suspended below the envelope. Mounted on the same wheel were four incendiary bombs. Suspended from the hub was a slender high-explosive bomb. All the bombs could be released before another incendiary device caused the envelope to burst into flames, making it harder for the enemy to understand the new weapons. In practice, though, the balloons frequently failed to operate according to design. Once released, the Japanese had no control over the balloons’ trajectories. Some of the balloons even drifted back onto the Japanese homeland. The day after the first weaponized balloons were launched an American ship discovered a rubberized balloon envelope, some shrouding and metal parts off the coast of San Pedro, California. This must have been from an experimental prototype. Other balloon debris was found near Hawaii on November 14, ten days after the attacks began. By the end of December, 1944, the balloons had been discovered from Alaska to Montana and Wyoming, where one finally exploded on December 6. Balloons, fragments of the balloons and metal debris were detected far and near, from the Yukon and the Northwest Territories to Southern California. On February 15, 1945, a paper balloon envelope and some of the attached apparatus were discovered near Prosser, Washington. This was perilously close to the top-secret Manhattan Project reactor at Hanford. On March 10, 1945, one of the Japanese balloons drifted across a power transmission line leading from Bonneville Dam to the Hanford reactor. The resulting power outage caused the reactor’s coolant water pumps to shut down momentarily, until the first of two back-up systems kicked in. Lt. Col. Franklin Matthias, director of construction for the Hanford works, later claimed that the one-second interruption of the pumps delighted Hanford authorities. Because of the press to produce plutonium for the atom bomb, the back-up system for the water pumps had never been tested before. Steam generators kicked in to power the pumps as the designers had hoped they would. The first test of the reactor’s back-up system came in the emergency shut-down caused by an actual Japanese attack. That same day balloon envelopes with attached apparatus, we’re discovered near Ephrata and Satus Pass. Another burned balloon was found near Toppenish, and a complete balloon was recovered on Cold Creek, virtually on the doorstep of the Hanford reactor. The following day a second balloon was found on Cold Creek. These balloons might possibly have changed the outcome of the war if they had drifted on a few more miles and bombed the Hanford reactor. Other balloons or their partial remains were located at Moxee, Asotin, Walla Walla, Spokane, and numerous other locations throughout the area. A second balloon was also located near Ephrata. Authorities were concerned about Japanese explosives carried by the balloons. But officials warned that there might also be biological agents aboard. American farmers and ranchers were told to report strange illnesses their livestock might develop. The Japanese never included biological agents in their balloon attacks. The government initially chose not to publicize the balloons. They didn’t want the Japanese to think the bombing program was succeeding. In January, 1945, after major publications had written about the balloons, the government directed the press not to print anything else about them. That policy changed when the balloons finally claimed victims, the only people on the continental mainland to die as the result of direct enemy aggression in World War II. On May 5, 1945, Elsie Mitchell and five of her young Sunday School charges died when the balloon they discovered near a road near Bly, Oregon, exploded. The children were 11-14 years old. The party were on a picnic and fishing outing from their church. Elsie’s husband Archie, pastor of the church, was conversing with road workers when the explosion took place. Elsie Mitchell was pregnant. She is buried under a family monument in Port Angeles, Washington. There is a historical monument at the place of her death, which has received pilgrimages from Japanese citizens seeking to apologize for the balloon bomb program. We don’t really know why the Japanese decided to scrub their balloon bomb program. By the middle of 1945 the tides of war had turned against the Empire and it’s possible that resources needed to be re-allocated to defense. But American geologists had also analyzed the sand in ballast bags from the Japanese balloons. Fossil forams and diatoms that were discovered had their origins at a single beach north of Tokyo. American planes photographed the area and intelligence officers located the hydrogen plants that produced gas for the balloons. These were taken out by bombing missions, and the Japanese no longer had the means to float balloons across the Pacific. 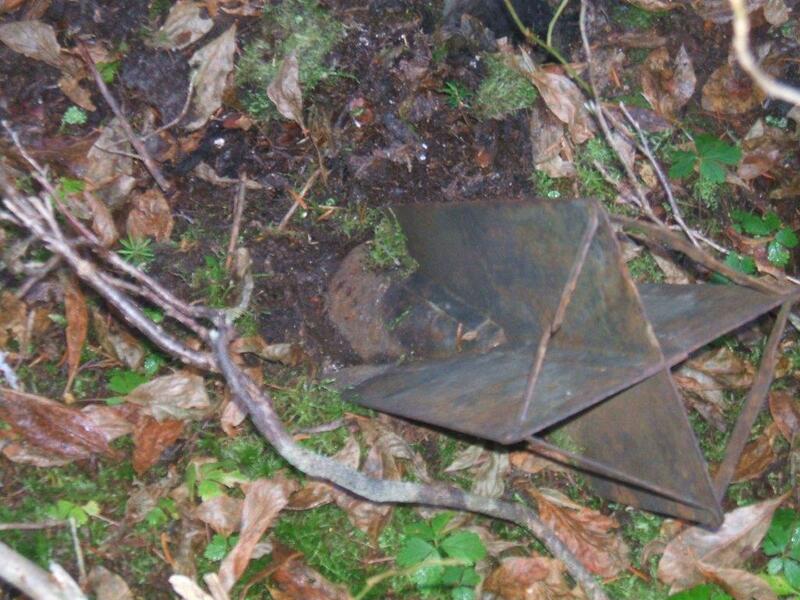 Metal debris from the Lumby balloon bomb was scattered across the forest floor. Photograph courtesy of Infonews.ca. I love to hike and often I get the most enjoyment from bushwhacking through off-trail areas. 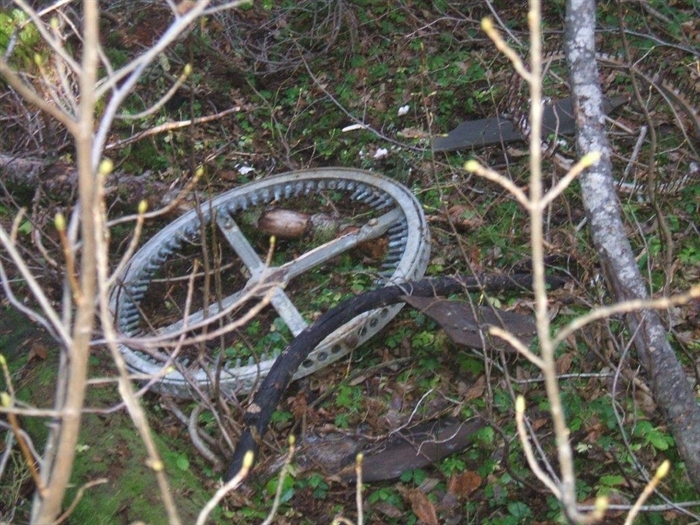 I know that if I were doing that and I happened across an alluring pile of junk, my urge would be to poke around until I was able to make a coherent narrative of just what this thing was and why it was in this spot, far from the beaten path. Such a habit could get a person killed. If a thousand Japanese bomb balloons reached North America and we can only identify around 280 places where they landed, there could be hundreds of unexploded bombs still waiting to do damage. Nobody knows where the next balloon bomb might be found. By now organic materials used in the envelope and shrouds would have decayed. What would remain would be the aluminum ring that housed the explosive plugs controlling the ballast bags, metal posts, crossed bars, rings, a circular bakelite plate, and the bombs. These would still be lethal. I found helpful information for writing this entry in Hill Williams’ book, Made in Hanford: The Bomb that Changed the World. Information about the location of balloon discoveries and the incidents connected with them can be found on the website entitled Japanese Balloon Bomb attack on the US. You can read the Infonews.ca story about the discovery of the Lumby bomb here. This entry was posted in Balloons, Conflicts, Education, Geology, Hanford, Hanford Atomic Energy Reservation, History, Japan, Washington, World War II and tagged Alaska, Archie Mitchell, Asotin, Atom Bomb, Ballast, Balloon envelopes, Balloons, Biological Warfare, Bly, Bombs, Bonneville Dam, British Columbia, California, Canada, Central Washington, Cold Creek, Debris, Detroit, Diatoms, Eastern Washington, Education, Elsie Mitchell, Ephrata, Forams, Foresters, Fossils, Fu-Go, Geologists, Geology, Hanford Reservation, Hawaii, Hiking, Hill Williams, History, Honshu, Hydrogen, Imperial Japanese Army, Infonews.ca, Intelligence, Jet Stream, Lt. Col. Franklin Matthias, Lumby, Manhattan Project, Mexico, Michigan, Montana, Moxee, Mulberry, North America, Northwest Territories, Oregon, Pacific, Pacific Coast, Planes, Plutonium, Port Angeles, Prisoner-of-War, Prosser, Reactor, San Pedro, Sand, Satus Pass, Scientists, Second World War, Silk, Spokane, Submarines, Sunday School, Tokyo, Toppenish, Walla Walla, Washington, World War II, Wyoming, Yukon. Bookmark the permalink. Just wanted you to know, I came across you blog while searching for Rosa Kuhnhausen Surface. I put something about it on my weather site so maybe a few Glenwood people will starting reading your interesting articles. Thanks for that. My Rosa was my great-aunt, and I continue to have ties to Glenwood, though it’s a long trip from where I currently live. I got married there on the acre of ground my mother left me. And next time, I will hopefully proof read before I post a comment.